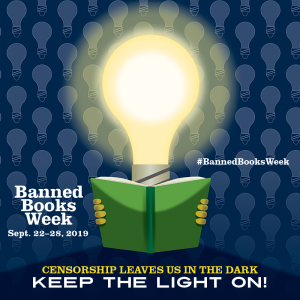 Between Sunday, September 23, and Saturday, September 29, Open Road Media is donating a portion of the proceeds from the sale of 36 challenged and banned books to the Banned Books Week Coalition! You can find the list of books that are part of the initiative at the Early Bird Books website here. It includes books that were burned, such as Albert Einstein’s Essays in Humanism; books that were banned, such as Pulitzer prize winner The Good Earth by Pearl S. Buck; books that were censored, such as From Here to Eternity by James Jones; and books that were challenged, such as Boy’s Life by Robert R. McCammon and The Color Purple by Alice Walker. With 36 titles to choose from, you’re certain to find a book to suit your tastes! Follow the links in the article to purchase the e-book from your preferred vendor, and a portion of the sale will be donated to the Banned Books Week Coalition to support our work defending — and celebrating — the freedom to read!